I have to admit the inspiration came in part from Muscatine Street Maintenance Supervisor Randy Howell who told me during a meeting earlier in the week that city crews had been out clearing brush away from the old railroad bridge on the abandoned Iowa, Chicago & Eastern Railroad Corporation tracks west of Houser Street. That bridge is part of the Pollinator Park Trail, a one-mile segment that circumnavigates the park and travels around the Muscatine Transfer & Recycling Center from the Kent Stein Park trailhead back to the Houser Street-Musser Street intersection where it reconnects with the Kent Stein-Deep Lakes Park Trail. Most of the trail has a rock base which is easy to traverse while walking but does make riding the trail a bit more of a challenge. Paving of the trail is anticipated later on if a grant can be secured to pay for the paving. Meanwhile, the trail can be walked but just be warned that there is still some work to be done at the bridge before it will be available for pedestrian traffic. While out taking pictures of the bridge I did decide to walk the trail … after all it is just a mile in length and it was a pretty pleasant day. While the grasses, flowers, and trees that will beautify the Pollinator Park are still in their winter slumber or awaiting more appropriate weather to be planted, the walk did give me a sense of what visitors can expect in the months and years ahead. Once over the bridge, the trail turns and runs alongside the area where the Muscatine Dog Park will be located. The grass is still pretty brown but the area is staked out and you just can imagine the three fenced in areas that are planned, the trees that will be planted, and almost hear the playful barking of the many canines and their owners who will be able to take advantage of Muscatine’s first dog park. The trail continues on into Pollinator Park itself. Even the noise from the passing vehicles on the 61 bypass cannot drown out the songs sung by the many birds that inhabit the area or dampen the tranquility of this walk through nature. Imagine, if you will, the park as it matures and becomes a haven and a home for all the pollinators that are so important to our lives. (You can Google Muscatine Pollinator Project for more information). Every step of the trail will take the pedestrian or bicyclist past something worthy to see or to experience. Even walking around the Recycling Center & Transfer Station has its rewards in the nature that abounds along that stretch of the Muscatine Slough. This is another great addition to the trail system and the park system that the City of Muscatine and Muscatine County enjoys. This is a testament to the visionaries who have worked and are working hard to provide safe, accessible places to walk or ride a bike. These individuals are not resting on their laurels either as they continue to discuss and seek out ways to enhance the current trails or find funding to create new trails or extend others. Among those are a short section that would connect the Muscatine High School trailhead on Cedar Street with the Houser Street trailhead located near Karen Drive, the currently in development West Side Trail that would connect the Kent Stein trailhead with Discovery Park, and the Mad Creek Trail which may become part of the Riverfront improvement project and complete a recreational trail that would extend from the Mississippi River to the Park Avenue West trailhead on the north side of the bypass. What Muscatine has is a concerted effort from both the public and private sectors to create recreational opportunities that will keep residents and visitors coming back and enjoying the simplistic, safe, and accessible parks and trail systems that Muscatine offers. 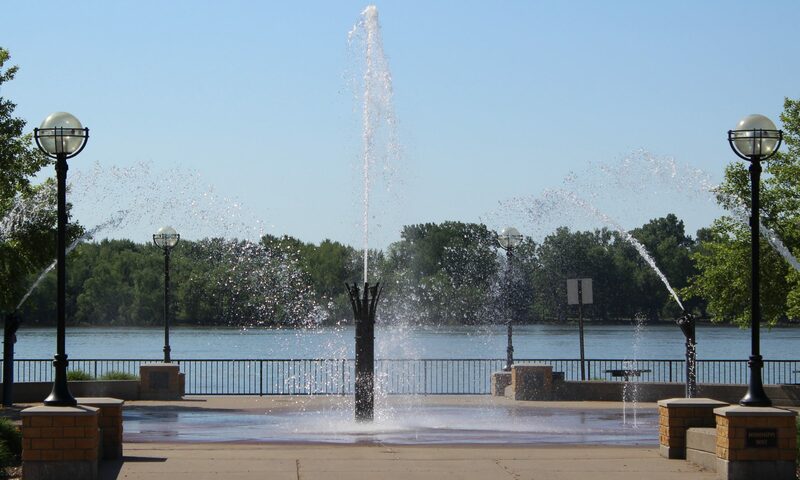 It is a vision that extends beyond the riverfront, beyond the downtown area, and even beyond the borders of the city. Pollinator Park will become a valuable gem among nature lovers and outdoor enthusiasts as it matures in the years to come. It will be an educational experience for school children and adults alike. It will be a recreational experience for those who just want to commune with Mother Nature (as long as she cooperates with warm temperatures and at least partly sunny skies). These little loops off the main trail are a welcomed change to the hiker or bicycle rider. And this is just the first of the “mini-trails” that the City of Muscatine and trail enthusiasts are looking at. There will be more to come on this little off-shoots of the main lines in the future. Until then, I look forward to another hike along the Pollinator Park Trail later this year and capturing the maturing landscape and the pollinators who will also be paying a visit on their travels.